Home / Horse Care / Horse Treats: What To Feed And How? Horse Treats: What To Feed And How? 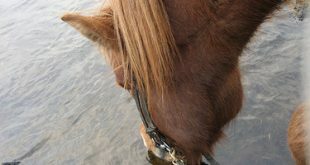 An integral part of owning a horse is training your horse. An untrained horse can be quite a tough pet to handle. And training horses isn’t all that difficult if you know how. One great element in horse training is praising and rewarding. Just as with any human being, horses love being praised and treated. They’ll also learn much faster if you know how to use the treat as a lucrative incentive! You may find these are handier to get – but please, for your horse’s well-being, steer clear of these! Now, there’s a reason for listing quite a few varied options – what your horse will consider as an actual treat will differ from horse to horse! They have a strong sense of taste, and what one horse likes another may not even touch! So you need to be patient and find the right ones through trial and error. You might think it convenient to carry treats in your pocket and feed often (this is usually the ‘done’ thing!) – but that’s a bad habit in the making. Your horse will learn to expect treats out of every pocket! So don’t do that. The ideal way to give treats is in a bucket or in his feeder – he’ll know that it is a special reward, and also learn to be patient and well-behaved! Be careful when feeding over-eager greedy horses – they tend to swallow too much and then choke! Never feed whole apples or carrots –they increase the risk of choking. Certain horses can have specific allergies – so when choosing a treat, if it makes him act strange, consult the vet first. It may be a treat he’s allergic to, and you may need to choose another. Training a horse can be a delightful task – especially if you are having fun and your horse is learning fast. And along with knowing how to train the horse, these quick and simple horse treats could actually make the task easier for you! Next How Much Supplement Should You Add To Your Horse’s Feed?